Episode Review: LEVERAGE, "The Girls' Night Out Job"
Leverage continued to give its audience more stand alone episodes with "The Girls' Night Out Job," but at least they put enough of a spin on it to make it fun to watch. Plus, it was Parker-heavy, which I'm always going to be a fan of, but I was just expecting a little more out of it. 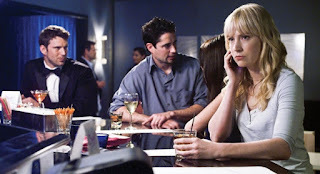 The Leverage Crew needed a much deserved night off, so Sophie had plans while the boys played poker, and Parker was supposed to meet up with Peggy, the woman she met during "The Juror #6 Job," to help her scope out a blind date. While on her night out, Parker got a funny feeling about her friend's date, and with help from Hardison, she found out that he was a thief named Craig Mattingly, so she posed as Peggy and recruited Sophie and Tara for assistance. As it turned out, the con-man was using Peggy as a way in to the Venezuelan Consulate (she was catering an event there) so he could sell top secret information about the country's oil supply to the highest bidder. The Leverage Girls decided to take it upon themselves the thwart his plans and to make sure that the information got to the right people, but there was a twist in the form of a bomb that was planted by one of the buyers. Of course, the ladies didn't need any man to help them defuse the bomb because they just pushed it out the window. At the end of the night, the good guys won, Parker still had her friend, and Tara hooked up with Mattingly, so it was a solid night all around. It was nice having Tara back, I liked her stint as the Crew's grifter, and I enjoyed how she and Sophie had a friendly rivalry throughout the episode as they tried to prove that their approach to conning was better than the other's. Plus, she made Sophie interesting for the first time in a long time. While I don't wish for shows to fail, part of me wants Body of Proof to end after Season 2 just so Jeri Ryan can show up more often (and Dana Delany can finally be in a Castle spin-off). While Tara brought a spark back to the Crew, "Girls' Night Out" was clearly a Parker centric episode which was what made it special. Parker's always been an interesting character because she's the only one who's never quite been on the same page as the rest of the team. It's been hard for her to give up her past ways and embrace Nate's mission, and seeing her struggle with becoming a good guy has been one of the most satisfying journey's that this show has given viewers. The fact that she can recognize when someone's in need and that they need to intervene has been a great example of character growth that most shows like Leverage don't bother with. Seeing her become more connected with others, Hardison in particular, has also been a delight to watch, and I was glad that "Girls' Night Out" shined a spotlight on their relationship without hammering us over the head with it. Hardison jealousy of the thief, and Parker's realization that the fact that she and Hardison are very different but that's why they work were genuinely sweet moments. Hardison's idea of a good date night: Fighting Robots. Betting on every hand in poker is pretty annoying. I should be irked that Parker can make Hardison do anything she wants with a "please," but she's so dang cute that I can't blame him. I knew that it was coming, but I was glad that they intercut scenes from next week's "The Boys' Night Out Job." I kinda liked Mattingly, and he did have chemistry with Parker. I was relived when she went back to Hardison, but I hope we see Mattingly again. Tara and Mattingly hooking up seemed kind of odd. Eliot: "Hell, even Hardison's got his little Internet friends. They're elves and gnomes, but..."
Hardison: "Orcs. They're orcs. You just don't listen." Parker: "Peggy, he's not who you think." Peggy: "He's a hot guy who likes cats!" "Parker, are you still with that guy?" Mattingly: "Word is you got out of the game." Parker: "No. No, I'm still in the game. I just play by a different set of rules." Having the women of Leverage front and center was a novel idea, and this episode had some decent moments (mostly thanks to Parker), and it was fine, but it once again didn't amount to much in the long run. I'm hoping that next week's "Boys" outing will add a little more to the larger narrative, but I doubt it will based on the rate they're going.